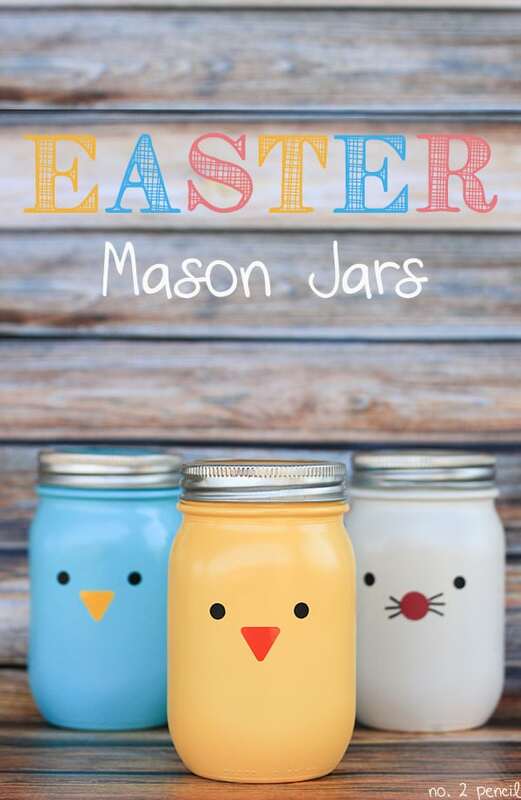 I had so much fun whipping up these little Easter Mason Jars. I was inspired by the ghost mason jars I made for Halloween last year. 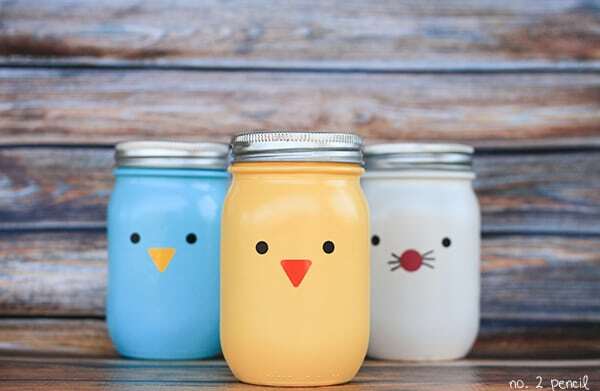 For this project, I used spray paint to quickly paint the jars, then I used my Cricut Explore machine to make the sweet little faces out of adhesive vinyl. 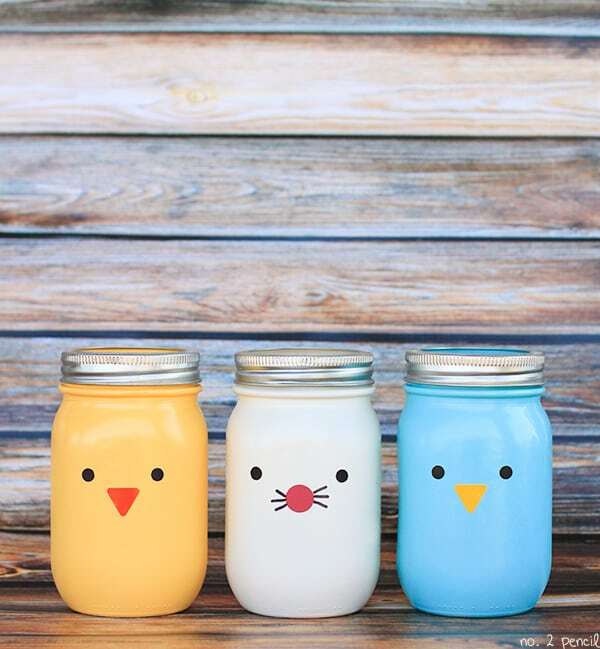 These Easter Mason Jars were easy to make and they would be perfect as vases or candy jars. Step 1. Clean mason jars with rubbing alcohol to remove any oils or residue. Step 2. Spray paint mason jars. Use smooth even strokes and let jars dry between coats to avoid dripping. Step 3. 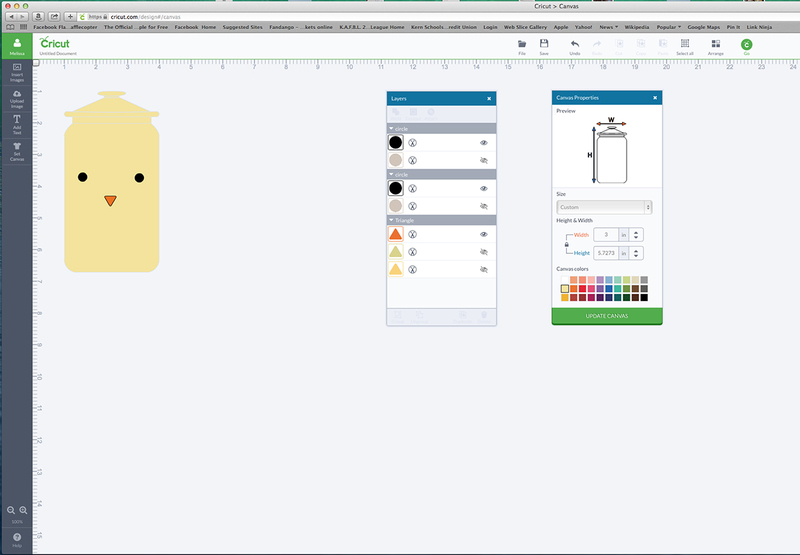 Layout design in Cricut Design Space. I really loved using Design Space to get an idea of what I wanted my project to look like. 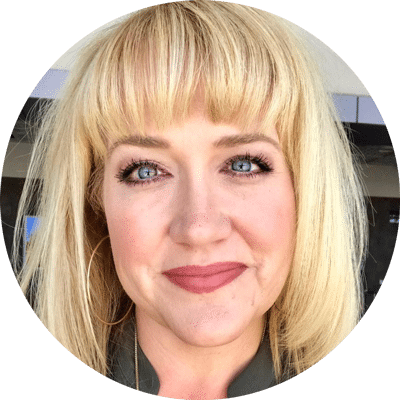 Click on the image below to get a better look at the layout in Design Space. I selected a canister as my canvas, because it was the closest shape to a mason jar. Then I adjusted the size of the canvas to match the size of the jars I was working with. Finally, I used circles and triangles to create the little faces for my jars. When I’m using adhesive vinyl, I always save the small pieces. They are great for projects like this. 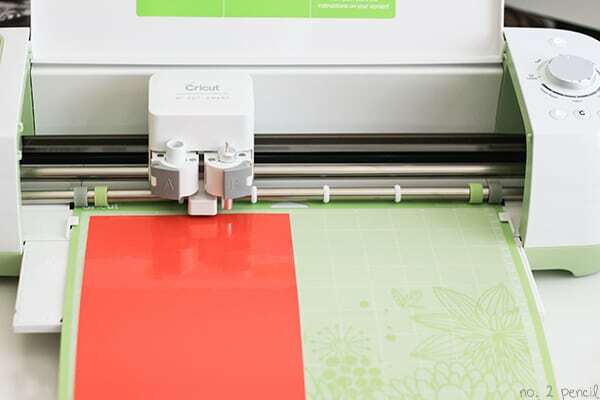 The Cricut Explore cut them quickly and unbelievably quietly! Step 4. Once paint is dry, transfer vinyl to mason jars. I wanted to add a little something extra to the bunny, so I drew whiskers on with a Sharpie. I mean, who could resist these guys? For this project, I used spray paint because that is what I had on hand. Spray paint is perfect for a fun and easy craft like this. If you want a permanent paint finish, you might try the glass paint I used on my ghost mason jars. A few notes: Cricut was kind enough to send me an Explore to review and use. I have not been compensated by Cricut and the love of the machine is my own! Seriously the cutest. LOVE the sweet faces! These are seriously cute and brightened my morning! Did you just use regular spray paint? Yes, I used both Krylon and Rustoleum that I had on hand. Both worked great! Oh my goodness, these are so stinkin cute! These are too cute! When you painted them did you leave them upright or did you turn them upside down before hand? Your jars are so smooth and I’m afraid I will end up having drips everywhere! I turned them upside down and painted them with very thin coats. Make sure to let it dry between coats and you will be great!!! They are spray painted on the outside and once dry, vinyl is placed over the spray paint. Hope that helps! I just adore these mason jars! Just wanted to pop in and let you know that I included them in a Easter decoration round up on my blog (http://www.vlhamlin.com/diy-projects/10-diy-easter-decorations/) Hope that’s okay! Can you not use some other paint inside? I wanted to do it with little children, and I thought if you could shake paint inside it would be lots less messy. Sure, craft paint would work great! These are just adorable. 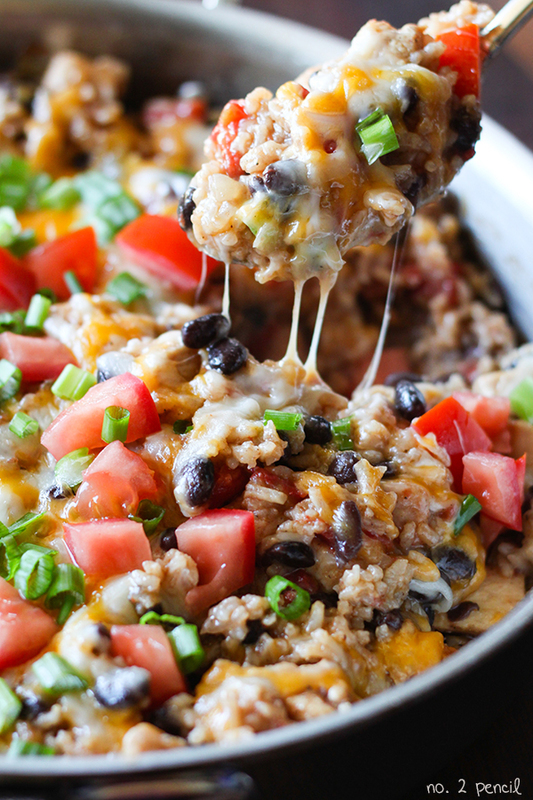 I love how easy they are to make. The kids would have fun helping to make them.